As an Event rider it is vital that our horses have a good technique in front over a fence as we jump solid fences. A fall from hitting a fence in front is often a heavy one and can have disastrous consequences. 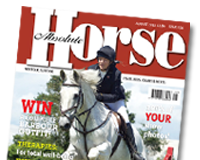 Therefore in Sharon’s training she uses various exercises to improve the horse’s technique, so find out how to improve the jumping technique in front in the November edition.